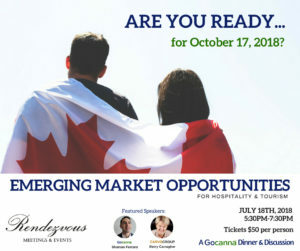 Simple Feast is proud to present Emerging Market Opportunities For Hospitality and Tourism, a Gocanna Dinner & Discussion. This event will take place from 5:30-7:30pm on July 18th at Simple Feast’s exclusive restaurant, Rendezvous. This Emerging Market Opportunities For Hospitality and Tourism event will focus specifically on the impending legalization of adult-use recreational cannabis in Prince Edward Island and will discuss the emerging issues and opportunities for PEI businesses in the new “Cannabis Tourism” industry. Gocanna Dinner & Discussion is a community engaged learning event that brings industry stakeholders together to discuss a focused topic, shared insights, and to identify innovative solutions that can be implemented to solve scenario-based challenges. This event includes a 3-course dinner served by Simple Feast.